Sitting right in the heart of Melbourne’s CBD, The Duke Rooftop boasts amazing views of the Forum, Fed Square and Flinders Street. 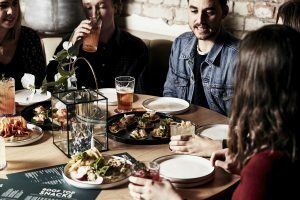 Enjoy mini prawn tostadas, finger lickin’ rooftop chicken, Lygon Street style lasagne croquettes and more from our rooftop menu while you soak in the city views. Our spring cocktail menu is rich with refreshing flavours and goes nicely with a rooftop snack. View the menu for our full selection of beers, wines, cocktails and food. Planning a night out? Book a rooftop booth! The rooftop is open 12pm – 1am from Monday to Saturday, and 12pm – 11pm Sunday.